Wilson’s words were inspired by a November 2013 interview with another prominent VC, Marc Andreessen. America’s love affair with the automobile is over, Andreessen declared. As evidence he pointed to a putative sea change in young people’s attitudes toward cars: “Today, ask kids if they’d rather have a smartphone or a car if they had to pick and 100% would say smartphones. Because smartphones represent freedom. There’s a huge social behavior reorientation that’s already happening.” I’ve never found financiers to be reliable guides to what kids are up to, but in this case Andreessen was just recycling a view that has achieved meme status in recent years: Americans are losing their taste for driving, and that trend is particularly pronounced among the young. [Healy] started the presentation by focusing on the “myths” about millennials and driving and promptly dispelling them. She noted that 80% of millennials get around by car most often and actually cover more ground than baby boomers and Generation Xers, due to millennials’ greater amount of spare time. As for the belief that millennials have little interest in getting a license and prefer other forms of transport, Healy pointed to the restrictive driving laws for people ages 15-21, such as restricted driving hours and the amount of people allowed in the car. There were also some surprising (for those who thought millennials didn’t like cars) statistics generated in this survey. For instance, 70 percent of millennials enjoyed driving vs. 58 percent of boomers and 66 percent of Generation Xers. The study also found that 76 percent of millennials would rather give up social media for a day rather than their car while 72 percent would give up texting for a week rather than their car for the same period of time. In 2010, as the industry was rebounding from one of the worst years in the postwar era, J.D. Power estimates those born between 1977 and 1994 (the firm considers them Gen Y) made up only 17% of sales, or 1.6 million vehicles. Five years later, that number has grown to 28% of sales, or 3.3 million vehicles. The impact of baby boomers and Gen Xers on industry volume has flat lined or fallen back during that same period. What does the distant future hold for car ownership and driving? Beats me. But I would be wary of putting a lot of stock in the grand sociological predictions of venture capitalists, no matter how confidently they’re expressed. VCs are as foolish as the rest of us. They love data when it backs up their prejudices and ignore it when it doesn’t. I’d also be wary of confusing temporary behavioral changes tied to the economic cycle with deeper changes in attitudes. As for Andreessen’s claim that smartphones represent freedom, I would guess the kids are a bit more nuanced in their views. 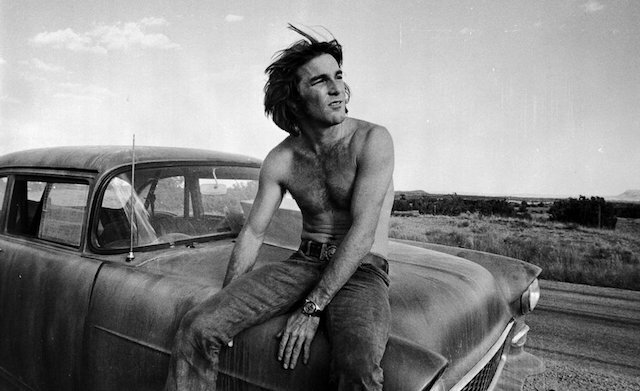 Image: Dennis Wilson and Chevy, from Two-Lane Blacktop. This entry was posted in Uncategorized on January 7, 2016 by Nick.